After a long period of resting and recuperating from knee replacement surgery (just the right one, not both), I have finally made it up into The Loft Studio to complete one project that I had started prior to my hiatus, and a second piece for an approaching juried show. 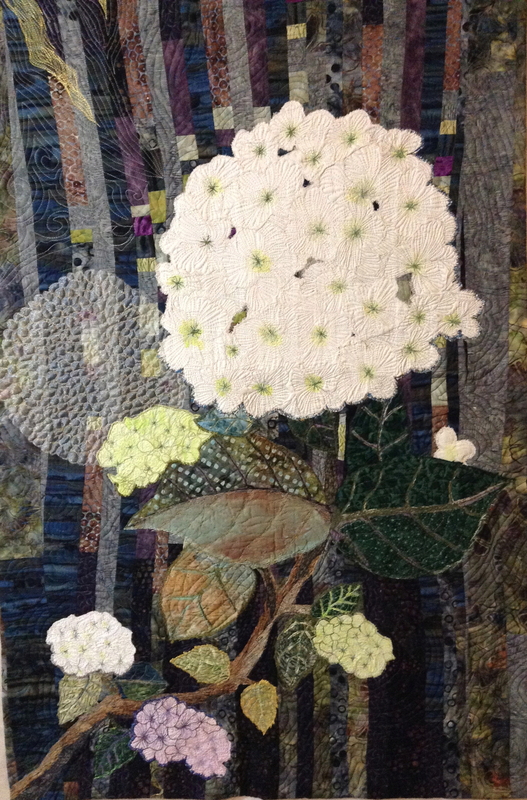 The Hydrangea piece, seen below, has been my experiment, my chance to try some new skills and fabrics. The background is pieced in a random fashion with very little planning. The hydrangea blossoms and leaves are machine appliquéd and machine embroidered. The fabrics include batiks, organza, silk and tulle. It is quite large, about 3′ wide by 5′ high. It will hang in the master bedroom suite soon. Solitude: Snow in Winter and Church on Sunday. ARTIST STATEMENT: Nothing could have been more reminiscent of my childhood in Minnesota than snow in winter and church on Sunday. This studio art panel combines the two in a folk art scene which is one of the styles I enjoy. Commercial fabrics are combined with artist printed fabric, 100% cotton and a variety of fabric from my stash. Superior Threads – cotton polyester and silk. Machine pieced and quilted. The poem “The Way It Is” by William Stafford surrounds the center scene. There’s a thread you follow. It goes among things that change. But it doesn’t change. People wonder about what you are pursuing. You have to explain the thread. But it is hard for others to see. While you hold it you can’t get lost. Tragedies happen; people get hurt or die; and you suffer and get old. Nothing you do can stop time’s unfolding. You don’t ever let go of the thread. William Stafford, “The Way It Is” from Ask Me: 100 Essential Poems. Copyright © 1998, 2014 by the Estate of William Stafford. Used by the permission of The Permissions Company, Inc. on behalf of Graywolf Press, Minneapolis, Minnesota, www.graywolfpress.org and the William Stafford Family Trust. 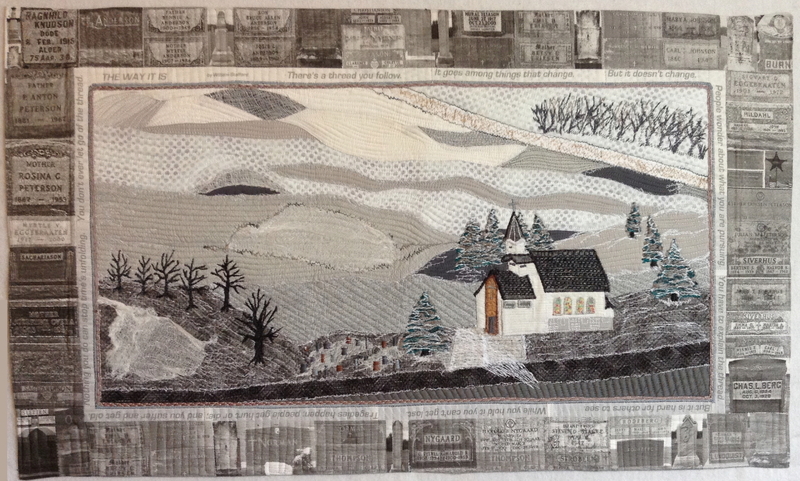 I also entered “Fall Frenzy: Watch Out Below” and “Farm Home: Where My Journey Began”, works completed during 2014. This entry was posted in Copyright© 2009 All images and text in all categories are copyright of Mary A. Ritter (aka M'Unique) and may not be reproduced without express permission., Fiber Arts. Bookmark the permalink. 4 Responses to Two new pieces completed…. Love both beauties! Glad you are up in the loft again and creating. They are both magnificent !! You are truly a great artist with fantastic ideas so beautifully transported onto fabrics for everyone to enjoyed, Amazing colors, patterns and details that are so beautifully mingled and intertwined. Mary, you certainly have all the qualities and talents to keep producing more and more breath-taking quilts. They are all award winning !!! Love them both – and to think you we’re recuperating from surgery when they were completed. You house is now officially a gallery of art….. Thanks for your supportive comments. I know how artistic you are, so I value your input! I did email you at your yahoo address. You’ll have to let me know if that one is still active. Your comments here come into my yahoo email, but for privacy you can just send directly there. Mary, I love to see your work. It’s so beautiful and personal! Please email me. I sent a snail mail card, but it came back.